In Chinese Unchopped, acclaimed teacher, TV chef and School of Wok founder Jeremy Pang demystifies the secret traditions of Chinese cookery, revealing the core techniques that bring the authentic flavours of traditional Chinese cooking into your own home.Opening with the Chinese Kitchen essentials, Jeremy outlines everything you need to know to set up a workable Chinese kitchen. All the necessary equipment such as cleavers and woks is covered, along with a dazzling array of ingredients that make up the Chinese pantry, with tips on which to buy when starting out. Above all though, the focus is on preparation - the key to unlocking successful Chinese cooking with its often lightning-quick cooking processes. Jeremy's ingenious 'Wok Clock' sorts your prepared ingredients into the right order for rapid cooking with stir-frys and sautees.Once you've covered the essentials, Chinese Unchopped moves through six chapters outlining the fundamental techniques in Chinese cooking, including stir-frying, deep-frying, steaming, poaching and braising, roasting and double cooking. 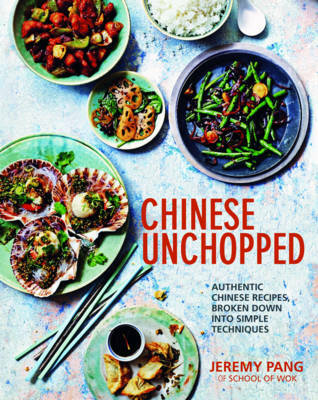 Recipes are taken from across China: from sweet Cantonese to spicy Szechuan. Jeremy even includes dishes influenced by the cuisines of Thailand and Malaysia. Authentic versions of take-away staples include Sweet and Sour Pork and Salt and Pepper Chilli Squid are included alongside more adventurous recipes like Grandma's 'Lionhead' Meatballs and Sea Bass with Crushed Soybeans and Chilli Sauce.Crammed full of information presented in an engaging, accessible way, with Chinese Unchopped you'll soon have the sizzling aromas of exceptional Chinese food filling your own kitchen - day in, day out.